Destiny’s Conflict (2017. 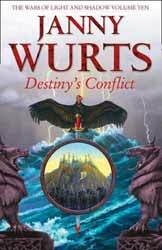 488 pages) is the tenth book in the Wars of Light and Shadow series of novels and the second book of the Sword of the Canon, written by Janny Wurts. The book is the penultimate novel in the series. Being the calm before the storm, the book does spend time wrapping up some of the minor subplots, presumably to clear a path to the final confrontation. Told from multiple point of view characters, we spend a lot of time with Arithon, still bereft of part of his memory/soul which is locked in a ring. This has led him to seek a solitary existence while he struggles with his dangerously explosive anger, which is a threat to those around him. He is on the run with a death mark against his name. Lysaer is the second, main, protagonist of the book and the opposite of his half-brother, Arithon. The curse which set brother against brother continues in the novel. As well as the main protagonists the book contains a not insignificant number of ancillary characters. Obviously, by book ten there is a lot to get through for a lot of people. The world building is good, if a little too descriptive for my tastes. The most noticeable thing which sets the book apart, in an already overcrowded market, is Wurts's use of language and sentence construction. The whole construction of the novel is intricate, the difference between looking at the clean lines of a circle compared to the filigree of a doily. The language used is highly descriptive, which is no bad thing, but just from my gut feeling of reading the novel, description accounts for roughly a quarter of any chapter. On the one hand this really puts the reader into the scene, but too much of it reminded me of reading Dickens’s Little Dorrit, in that sometimes you just want the book to stop contemplating its navel and get on with some dynamic action. Still, I suppose that there are worse criticisms than being compared to Dickens. This is not an odd instance of this style, as it pervades the whole novel and only the reader can decide if these sorts of linguistics gymnastics are to their personal taste. Likewise, Wurts seems to revel in the use of language and ably demonstrates a larger than normal vocabulary, seemingly revelling in the obscure when clarity would have sufficed. For obvious reasons the book does not work that well as a stand-alone novel. Wurts has included maps, a time line and a glossary of names and place, but this does not really make up for not reading the previous nine novels.